Our students have made the semi- finals of the Shape Your Talent, please could you vote for them as they stand to win £500 IN THE FINAL- TOP 3 GO THROUGH TO THE FINAL. 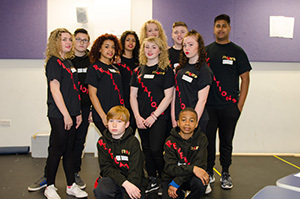 Revelations are a diverse dance group that ranges from the ages 12-18. We are a committed after school dance crew that takes place at Phoenix Collegiate. We create all our own choreography and explore different dance genres as a team. We are all from different backgrounds but come together as a family to create inspiring, and energetic choreography to give off an atmosphere of enjoyment for our audience. Our passion is to dance, so please vote for us as we have more exciting and fresh choreography to unleash at the final. You won't regret it! PLEASE VOTE FOR US AS WE HAVE DONE SO WELL SO FAR. YOU CAN VOTE AS MANY TIMES AS YOU LIKE!! !